Machine is designed to operate continuously. First block is provided OTO type for wire accumulation, allowing forth removal of any rod, snarl or changeover of coils at feeding end. VFN system on OTO block keeps uniform tension of wire passing over with on jerks. Each block is equipped with pressure regulating valves and gauges for accurate control of air pressure on sensor arm. Separate manifolds are provided for water to drums and dies with regulating valve on each block. 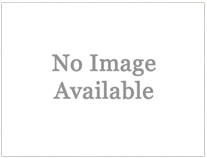 Drawing drums are forged alloy steel, fully hardened and ground. Surface hardness: 58-60 HRC. Drums are internally water cooled with narrow gap system. Complete wetting of wall by highly turbulent motion of water, higher cooling effect with increasing drawing speeds. Drums are externally cooled by air from a single common blower through duct forming part of machine frame. Dies are direct water cooled from a separate manifold. Dies are loaded from top for quick fixing. Motorized rotating die holders can be provided; extra long to adopt standard pressure dies. Die boxes are equipped with motorized lubricant stirrer. Rotating die holders have single motor for stirrer and holder. Die boxes are adjustable in horizontal and vertical plane for cast and helix adjustment of wire. Die boxes are suitable for dry lubricants, large enough to store sufficient quantity of lubricant. Speed regulation of each block is achieved through self cantering sensor arm on which the wire is guided. Well balanced sheet metal guards, with transparent sheet/wire mesh to see through condition of machine, are provided. Guards are electrically interlocked not to allow running of machine with open guards. Sound proof guard for low noise level with suction of burnt powder can be provided. Motion transmission from motor to block shaft is achieved directly by V belt and pulleys or through helical gear arrangement. Specially designed A.C. Three Phase Inverter Duty/Servo Motors L&T Supernova/Siemens 1ph7 constant torque up to base speed and constant power above base speed. Digital A.C. Three Phase Vector Flux Inverter Drives ABB ACS 800/Siemens Kinemics provide the system with fastest communication through provirus. All blocks are working with a range of encoder feedback, thermal protection, and flux vector controlled. The logic control is attained automatically by PLC system (Siemens) automatically calculating reduction rate and monitoring all related dates. Utmost control flexibility allows any drafting programme and drum skipping. HMI displays all function data making it easier for the operator to take control of the machine during production. Displays and memorizes the fault for easy diagnosis. Can be interfaced with remote computer to collect all information. Cubicles are sheet steel enclosures with IP54 protection, duly power coated and with exhaust. Electric control system provides a smooth acceleration from zero to pre-selected value. Normal stop is attained with ramp down control within 15 to 30 second. Emergency stop/quick stop is attained within 6 to 8 seconds. 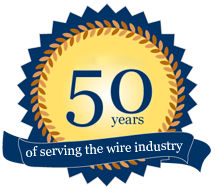 This can be achieved without a broken wire. Each block is driven through heavy duty worm and wheel reduction gear box fabricated from steel plates. 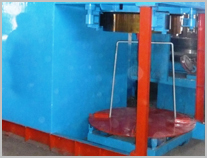 Drawing blocks are made of graded CL and metalized and ground on drawing portion to HR c 58 for good wear resistance. Block are designed for cooling by circulation of water internally and by air externally to attain good draw ability of wire. Dies boxes can be supplied with rotation die and lubricant stirrer. Vertical - horizontal & gravity bull blocks with multi speed & variable drives Suitable for ferrous - non ferrous wire ranging from 6mm to 25mm inlets & models of 750mm /900/1000/1200mm dia coils. 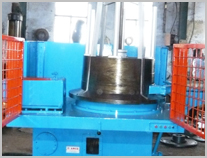 Gravity Blocks are offers for processing of larger dia wires/wire rods; with higher productivity and ease of operation. The dies are direct water cooled. The coiling trolly is motorised. 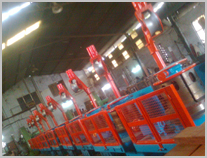 The machine is available with block dia 760, 900, 1000, 1250mm for wire size 32mm to 7.0mm dia.